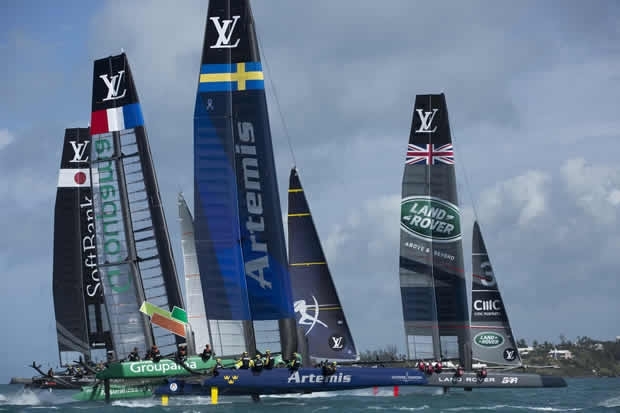 The Louis Vuitton America’s Cup World Series is bringing America’s Cup racing to Bermuda for the first time since the mid-Atlantic island became the host venue of the 35th America’s Cup. The defending champion, Oracle Team USA, selected Bermuda as the venue in December of 2014 and moved its team base here in the spring. This event marks the first official racing featuring all six teams in the America’s Cup. Oracle Team USA skipper Jimmy Spithill calls the support from Bermudians for the event and all the teams “unbelievable” and says he’s looking forward to repaying that sentiment. Further down the standings, Softbank Team Japan leads Artemis Racing and Groupama Team France. Each of these teams is looking for a ‘comeback’ performance in Bermuda. Over 1000 boats have already registered as spectator craft to watch the racing on the Great Sound.